So, I pulled out the scale this morning and hopped on. Well, hopped on gingerly. I’m still favoring my right foot. It has its moments where it prefers not to bear me up. Anyway, I was disappointed to see I lost ground. Or rather, gained fat. Since returning from my L.A. trip in June, I was making steady progress down the number line. I was so pleased, ten pounds and counting. Soon I would be able to zip up my size 8 jeans again. I have a closet full of clothes waiting for me. But, this latest trip cost me three pounds, and I’m not talking English currency. It couldn’t be helped I suppose. It started with the beignets and went downhill from there, or maybe I should say uphill. That same day I was served what appeared to be a mere taste of an entrée. Four jumbo shrimp stuffed with crab laid out artistically in a row on a long, white rectangular plate. I should’ve taken a picture. Surprisingly, I could barely finish it. It was deceptively filling. 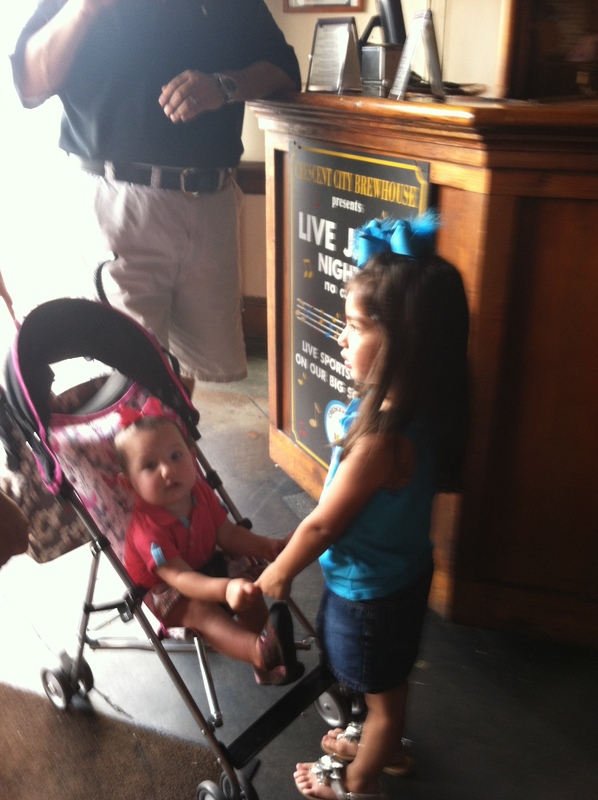 The girls share a moment while we wait to be seated. Then there was the trip to Sonic; my daughter had to stop there. The commercials are so appetizing and we don’t have a Sonic close by at home. 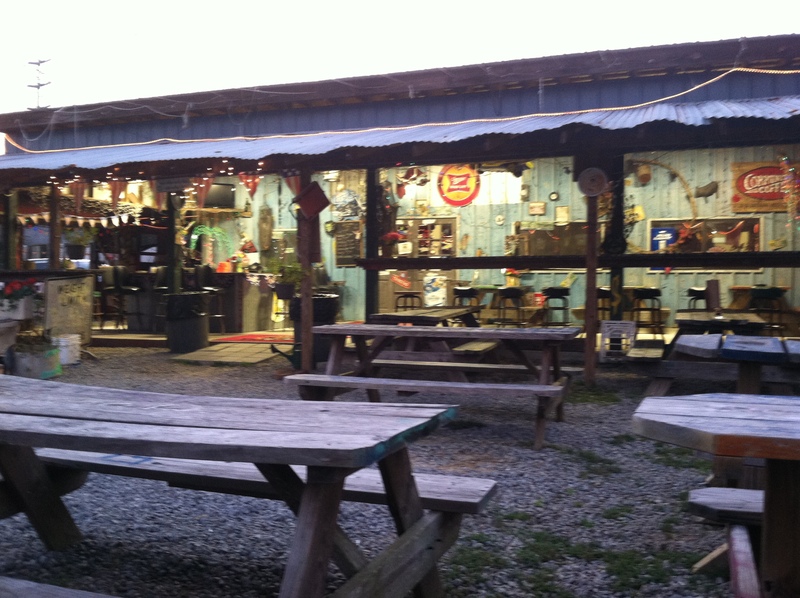 And then The Shed, where they served barbecue chicken wings that fell off the bone, with French Fries, of course. 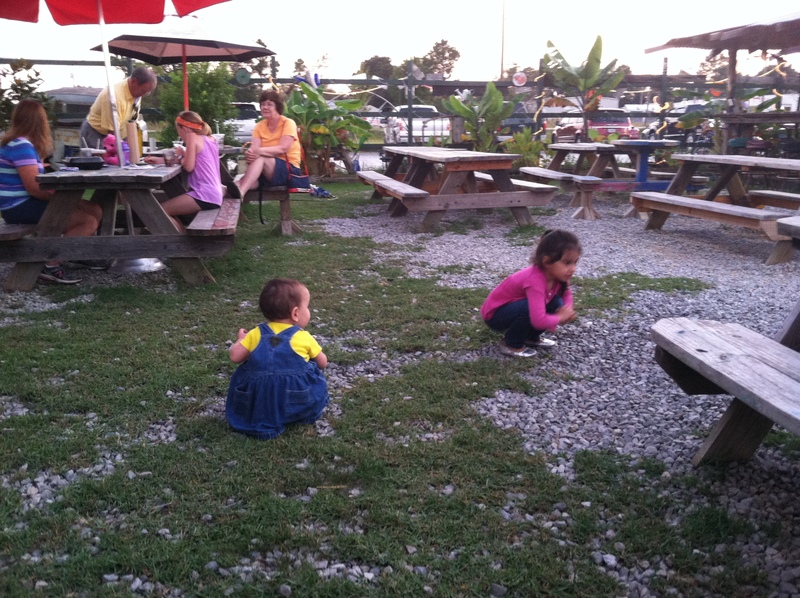 The food was delicious, the place eccentric and the girls had a blast playing with rocks. The Shed. Pretty awesome little place. Rocks. Best toys in the world. There were the tiny star-shaped sugar cookies sent from Texas that melted in your mouth and went fantastic with your morning coffee. And of course, you could never eat just one. They were barely an inch wide; how many inches could they add to a waistline? And the must-have trip to the family-owned restaurant to have crab cakes cooked in the shell. Oh, how I wish I had a taken a picture of them. The sight of those crab cakes would hold me until my next visit. Not to mention the hush puppies, yum, and the appetizer of fried crawfish and jalapeño peppers. Strange combination, but tasty. And then of course, the birthday cake. Delicious. Followed by the lollipops I snagged off Alyssa’s collection garnered from the burst piñata. And last but not least, the pepperoni and mushroom pizza on our last evening at my son’s home. No, the truth cannot be denied. I ate too much! This entry was posted in Family, Health, Humor, Life, Love and tagged Eating, Enjoyment, Family, Life, Love on October 30, 2013 by Irma. That’s true. And my main goal in keeping my weight within my height limits is that it makes it harder for RA to catch up with me! But, it all was so delicious.